A. Hammer cocked, engaged with trigger sear. B. 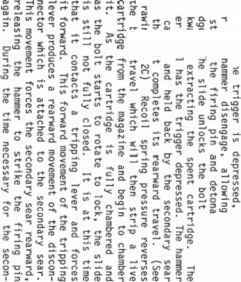 Trigger 1s depressed releasing hammer to strike the firing pin and detonate the cartridge. Secondary sear moves forward slightly. C. The trigger is still depressed. The slide and bolt have cycled rearward causing the hammer to be forced rearward and engage the secondary sear. D. The slide and bolt have cycled forward stripping a cartridge from the magazine. The trigger is released and the secondary sear releases the hammer as the trigger sear engages and holds the hammer, ready for the next firing cycle.